The ancient parish of Llangollen was divided into three parts ('traean' means 'one-third' in English): Llangollen Traean, Trefor Traean, and Glyn Traean. Llangollen Traean contained the townships of Bachau, Cysylltau, Llangollen Abad, Llangollen Fawr, Llangollen Fechan, Feifod, Pengwern and Rhisgog. Trefor Traean contained the townships of Cilmediw, Dinbren, Eglwysegl, Trefor Isaf and Trefor Uchaf. Glyn Traean contained the townships of Cilcochwyn, Crogen Iddon, Crogen Wladys, Erwallo, Hafodgynfor, Nantygwryd, Pennant and Talygarth. On 15 April 1848, the whole of Glyn Traean, together with the township of Cysylltau from Llangollen Traean, went to form the new parish of Pontfadog. Hovever, Cysylltau returned to Llangollen in 1870. There has been a church in Llangollen since probably the sixth or seventh centuries. A new building was erected in the thirteenth century; and another, probably in the early sixteenth century, following a fire. The tower was built circa 1750. 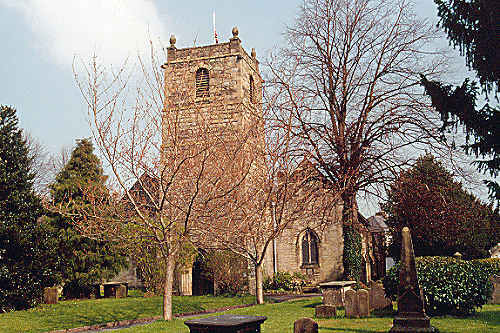 The church was restored and extended between 1876 and 1883. For family history information about the church and parish, visit the GENUKI Llangollen page.